During the last year we've been working on enhancements to better meet the needs of fleets and help fleets achieve compliance. These new capabilities enable customers to move further away from paper reporting and tracking, providing necessary information to the back office in real time. Rand McNally gave customers a review of new, significant enhancements to the TND™ 760 software. New features include a Driver Vehicle Inspection Report (DVIR); the inclusion of the "Oil Field Exception" in its Hours of Service application; the ability to provide routing information to the cab automatically from back–end dispatch systems; and map database and feature updates for its IntelliRoute® GPS navigation software. The electronic DVIR report will enable companies to immediately access potential maintenance issues, and reduce the use of paperwork. These reports can be saved for up to six months. Updates to Rand McNally's Hours of Service application include "Oil Field Exceptions", which are defined in U.S. DOT's Hours of Service of Drivers final rule effective February 27, 2012 section 395.1(d)(1) and (d)(2). For companies integrating TND™ 760 with a third party transportation management system, routing from point to point can be delivered directly to the in–cab device eliminating phone or e–mail instructions by the dispatcher, and manual entry of data by the driver. Within the navigation feature, enhancements include an upgraded map database with enhanced truck routing settings, and more. In July, Rand McNally previewed its latest product upgrades and product road map at our annual Clubs and Cubs customer event and business meeting. Attended by nearly 60 customers, partners and company executives, the business meeting also included a keynote speech and Q&A session with Larry Minor, Associate Administrator for Policy at the FMCSA. Mr. Minor addressed the next steps related to the new EOBR mandate. The EOBR mandate has become a hot topic of discussion since President Obama signed the (Surface Transportation Act of 2012, H.R. 4348 on July 6). The act mandates the use of EOBRs for Hours of Service logging. The bill received widespread bipartisan support and overwhelmingly passed both houses of Congress. The new law requires the FMCSA to issue rules regarding the mandate within the next 12 months. Minor confirmed that the compliance date would be two years after publication of the final rules. According to the FMCSA website, EOBRs enable roadside inspectors to quickly identify drivers in violation of HOS rules, decreasing the risk of fatigue–related crashes. In 2011, Federal and State CMV safety inspectors conducted 3.5 million driver inspections at the roadside, resulting in 1.2 million citations for driver violations of motor carrier safety regulations. Of these violations, nearly one–half were related to compliance with HOS or maintenance of logbooks, including exceeding daily and weekly driving time limits, false logs, "no log" violations, and non–current logs. 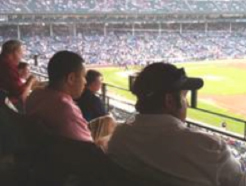 Rand McNally hosts its annual customer event and business meeting each summer in Chicago. The Rand McNally Connect web portal provides a single access point for fleet tracking, mapping, performance reporting, e–mail communication, as well as access to Rand McNally customer service and third–party applications. The web portal is accessible for all customers of Rand McNally's mobile communication fleet management solutions including the TND™ 760, TPC 7600 system and TruckPC products. Rand McNally’s solutions are integrated with products from TMW, McLeod and other transportation management systems. Geofencing – Allowing for complex polygon shapes to be identified as alert areas. When a vehicle enters or exits the polygon, an e–mail or SMS text message may be sent back to the company. Geofencing can be used to track entry and exit to analyze wait time at a customer location or to report vehicle detention time. Landmarks – Provides an easy to use tool for uploading a custom list of locations onto the map. Dashboards – Performance dashboards and trending charts give fleet managers instant visibility into fleet wide activities and issues. Dashboards include data on fuel consumption, fuel economy, idle time, hard braking, miles driven and speeding. Alerts – The improved notification feature allows for alerts to be communicated via an SMS text message or e–mail, identifying an important task in the process, such as arrival and departure, or a potential safety issue such as a hard breaking incident, or a cost containment opportunity such as extended idling.